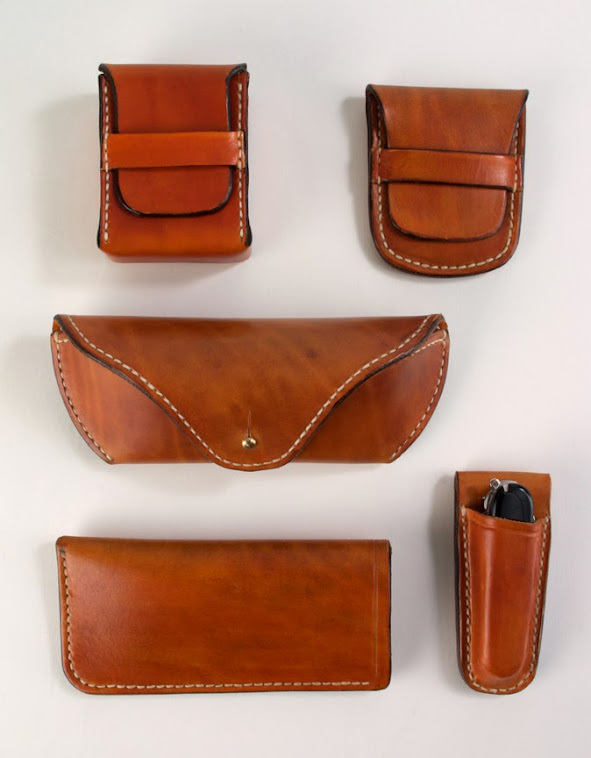 My aim is to craft individual items in a traditional and unashamedly old-fashioned way using only solid high quality leather and hand stitching. My philosophy is very simple - I will not make or sell anything that I would not be pleased to own myself. I like to think of these artefacts as an antidote to the cheap , insubstantial mass produced products which predominate much of today's marketplace. My inspiration comes from the days when luggage was made from heavy leather and canvas , shorts were long and baggy , moushtaches big and bushy and upper lips were seriously stiff ! Please look at the various examples of my work below. All items are individually made so please don't hesitate to contact me if you would like to commission something along the lines of the examples below or maybe something different. An interesting idea which I made at the request of a gentleman in Sweden. A credit card / bank note holder for when you really can't be bothered with a wallet ! You have to supply your own cards !! Lined Ray-Ban Cases (4 sizes) £45.00. Simple fixed blade sheaths (mora) £25.00. Wet mould sheath and Schrade Imperial knife £25.00. Opinel (no8) Neck / belt sheath (not including knife) £20.00. Rifle Bolt pouch . £35.00. i pod classic case £30.00. Leatherman / Swiss Army knife pouch sheath £35.00. 'Possibles' Belt pouches. (QD or belt loop) £45.00 - £65.00. Any thing else please ask for a quote. 'One off' commissions start from £50.00. My prices are based on £15.00 per hour and generally include materials however larger items may require an extra charge - The leather I use costs me approx £7.00 per sq ft ! N. B. Prices exclude Postage (and Pay pal commission if used). 'Family' photo of a range of Belt pouches for Leatherman wave tools. Sharpes Quigley - Seriously cool rifle !! Pancake sheath for Leatherman Wave. Rear View - Pigskin lining. Simple 'quiver' style sheath for fixed blade knife. Thanks to Roger Harrington for the loan of his beautiful 'prototype' knife. I am now making these of 2.5 - 3.0mm hide lined with pigskin . I have several different sized templates . Beautiful little knife - I made this for sale about a month ago and It's been on my belt ever since !! I've ordered some more and these and I will be selling them . These are 'street legal' in the uk. 'Old' style sheath for antique Thornhill knife. Bullet 'carrier' for Ruger No1. Case for Ray-Ban Aviator /Wayfarers . Lined with pigskin or chamois. Case for Ray-Ban Aviator / Wayfarer. Hide with Chamois lining. Wet mould sheath for MOD style penknife. 'Slip'case for spectacles. Hide , chamois lined. Eofor Custom Leatherwork. Watermark theme. Powered by Blogger.